This trip offers a fully immersive, unyieldingly African experience in a compact eight-day package. Soak up the wildlife and vibrant colours and scenery of Zimbabwe, Botswana, and South Africa, with wildlife walks and plenty of options for wildlife safari drives. Your rugged overland adventure vehicle (OAV) will get you to the sites safely and camping will allow you to fall asleep to the sounds of the wild underneath big African skies. Camp under the stars of the Okavango Delta and marvel at Victoria Falls, the adrenaline capital of the region. Small group experience; Max 22, avg 18. Cross the border into Botswana and enjoy a rhino drive in the Khama Rhino Sanctuary. If we do not arrive at the camp in time to do the rhino drive today, we will do it tomorrow morning before departing for Maun. Climb aboard our new custom built ride... overlanding G-style! Hop into an open air safari vehicle to search for the sanctuary's rhinos, and other wildlife species. Leave Khama Rhino Sanctuary and head to Maun. Opt to take a scenic flight over the delta. Please note: if you have pre-booked the Okavango Delta Flight, today's likely the day for this activity! Your CEO will give you final confirmation when it will take place, as it is subject to change. Get a fresh perspective on the vast wilderness of Africa with a once-in-a-lifetime view only a select few will ever see. Enjoy the hippos in the waterways and elephants and buffalo in the tree line. Gaze at the winding water channels as they make their way through the Delta. Pack a small bag for this overnight excursion; we'll leave our big bags with the overland vehicle. Please note that there are no showers or running water for toilets. Bring along 5 litres of water for both drinking and cleaning. Climb into a traditional dugout canoe for a closer view of the shoreline. Enjoy wildlife walks and viewing, mokoro trips (occasionally unavailable due to seasonality), and birdwatching in the pristine wilderness area of the Okavango Delta, the world's largest inland delta. In the evening, count the shooting stars, sing with the locals, or simply unwind with a sundowner (cheers!) around the campfire. Enjoy the towering baobab trees found around tonight's campsite and go for a dip in the pool if you need to cool off. Get a fantastic perspective of one of Botswana's national parks and its thousands of resident elephants, crocodiles, and hippos on a sunset boat cruise on the Chobe River. Bring a few drinks and a camera, sit back, and enjoy the view. Enjoy a drive along routes that overlook this beautiful river. Keep an eye out for the remarkable variety of animals that are drawn to this permanent water source. The Chobe River is home to incredible wildlife, and there is no better way to spot (and photograph) it. Climb aboard a custom designed boat equipped with mounted DSLR cameras. During this three-hour safari, instructors help you capture the perfect wildlife shots, with chances to spot elephants, hippos, crocodiles, and birds. This tour includes transfers, park fees, refreshments, camera usage (DSLR cameras with zoom lens), 8G photo memory card and an exclusive seat on the eight-seat photo boat. Drive across into Zimbabwe, and opt to visit Victoria Falls. Take in the natural splendour of thundering Victoria Falls while viewing the massive falls from the Zimbabwean side. Get strapped up, step over the Victoria Falls Bridge and free fall for 80 meters into the Batoka Gorge. Enjoy the views as you swing back and forth over the roaring Zambezi river, with cascading waterfalls at your side. Don't think you can hack it alone? Swing with a partner. Glide along a zipline track for 300 metres over the rapids of the Batoka Gorge below. 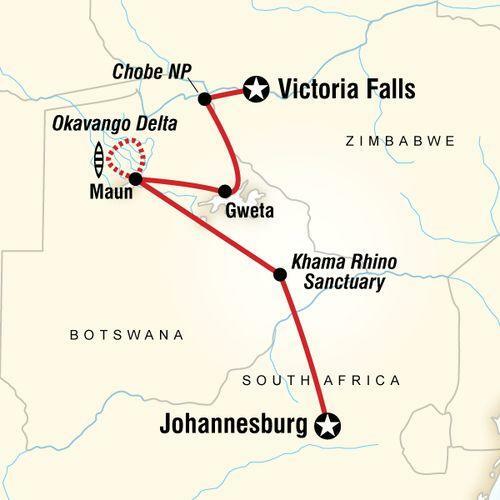 Take in incredible views of the Victoria Falls along the way. Take a short morning boat ride down the Zambezi river to the west side of the island overlooking Main Falls. Take in the incredible, close-up view of the rushing waters cascading over the steep rock face. Keep your eye out for rainbows on a sunny day. Due to high demand, we strongly recommend speaking to your CEO at the beginning of the tour to book this activity in advance. Please note that this activity takes place in Livingstone, Zambia, and visa fees are not included in the price of this activity. Take a swim on the wild side. Travel to Livingstone Island and take the opportunity to swim in the Devil's Pool - a rock pool at the lip of Victoria Falls, offering visitors the incredible experience of peering over the edge of one of the largest waterfalls in the world. Please note that this activity is only offered in the low water season (August to December), and on the Lunch and High Tea excursions. Due to high demand, we strongly recommend speaking to your CEO at the beginning of the tour to book this activity in advance. 6 breakfasts, 6 lunches, 3 dinners. Allow USD75-100 for meals not included. Overland adventure vehicle (OAV), walking, mokoro, safari vehicle. Khama Rhino Sanctuary Drive. Okavango Delta overnight bush camping excursion. All transport between destinations and to/from included activities. Camp in the Okavango Delta and track exotic wildlife, view the mighty Victoria Falls, try to steer a mokoro canoe, camp under the stars. 1. Please note that this tour combines with other G Adventures tours. As such, the staff and some travel companions may be continuing together on another G Adventures tour, after your trip concludes. 3. Sleeping bags can not be rented on any of our Africa overland or safari trips. 4. It is compulsory to show a valid Yellow Fever Certificate if you are travelling to Botswana from a Yellow Fever endemic country. Entry into Botswana when travelling from the following countries (but not limited to) will require a Yellow Fever Certificate: Angola, Benin, Burkina Faso, Burundi, Cameroon, Central African Republic, Chad, Congo, Democratic Republic of the Congo, Republic of the Cote d’Ivoire (Ivory Coast) Equatorial Guinea, Ethiopia, Gabon, Gambia, Ghana, Guinea Zambia, Guinea-Bissau, Kenya, Liberia, Mali, Mauritania, Niger, Nigeria, Rwanda, São Tomé and Príncipe, Senegal, Sierra Leone, Somalia, Sudan, Tanzania, Togo, Uganda, Argentina, Bolivia, Brazil, Colombia, Ecuador, French Guiana, Guyana, Panama, Paraguay, Peru, Suriname, Trinidad and Tobago, Venezuela. Please note that if you have booked the "My Own Room" option for this tour, you will receive your own single accommodation for all night stops, with the following exceptions: Day 4. The difference between the pre-arranged transfer (paid transfer) through us and the "free" airport transfer through the Airport Game Lodge is that you cannot pre-arrange the free shuttle. You will have to phone the lodge upon arrival at the airport in Johannesburg and they will arrange a pick up point just outside the arrival building whereas our pre-arranged "meet&greet pick up" will have an assistant waiting for you with a board and your name on it upon walking out the luggage arrival hall. South African Rand; Botswana Pula; Zimbabwean Dollar. We recommend that you bring US$ or South African Rand for personal expenses on this trip. Traveller's cheques are not recommended. Full country name: Republic of Zimbabwe (and formerly Southern Rhodesia, Rhodesia, the Republic of Rhodesia, and Zimbabwe Rhodesia). Officially the Republic of Zimbabwe and formerly Southern Rhodesia, Rhodesia, the Republic of Rhodesia, and Zimbabwe Rhodesia) is a landlocked country located in the southern part of the African continent, between the Zambezi and Limpopo rivers. It is bordered by South Africa to the south, Botswana to the southwest, Zambia to the northwest and Mozambique to the east. Zimbabwe began as the British crown colony of Southern Rhodesia, created from land held by the British South Africa Company. President Robert Mugabe is the head of State and Commander in Chief of the armed forces. Morgan Tsvangirai is the Prime Minister. Mugabe has been in power since the country's internationally-recognized independence in 1980. Major industries: diamonds, copper, nickel, coal, salt, soda ash, potash, livestock processing, sorghum, maize, millet, pulses, groundnuts (peanuts), beans, cowpeas, sunflower seed, livestock. Full country name: Republic of South Africa. Population: 47,432,000 (July 2005 estimate), 44,819,278 (Census 2001). Capital cities: Cape Town (Legislative), Pretoria (Admistrative) and Bloemfontein (Judicial). People: Zulu, Afrikaners, Xhosa, Basotho (South Sotho), English South Africans, Bapedi (North Sotho), Indian/Asian, Venda, Tswana, Tsonga, Swazi, Ndebele, others. Language: Afrikaans, English, Zulu, Xhosa, Swati, Ndebele, Southern Sotho, Northern Sotho, Tsonga, Tswana, Venda. Religion: Zion Christian 11%, Pentecostal/Charismatic 8%, Catholic 7%, Methodist 7%, Dutch Reformed 7%, Anglican 4%, other Christian 36%, Islam 2%, none 15%. Major industries: mining (world's largest producer of platinum, gold, chromium), automobile assembly, metal working, machinery, textiles, iron and steel, chemicals, fertilizer, food stuff, commercial ship repair. Currency: Rand (ZAR), consisting of 100 cents. All passengers are advised to check the Civil Aviation Authority of Zimbabwe website for updated information on applicable departure taxes for Zimbabwe: www.caaz.co.zw. CEO: $5-8 USD (per day, per person). Safari Guide/Driver: $2-3 USD (per day). Restaurant Staff: 10-15% of cost of bill. Okavango Delta polers: 50-100 BWP (Botswana Pula). Yellow Fever Certificate Note: (Updated: May 2017). * Beware of people approaching you on the street with an apparent interest of where you are from, and want to sit down and have a chat with you. These people are con men and will ask you for money. * People on the street who ask you if you want a safari and have a brochure are often con men, best to avoid these folk. Besides, you’re already on safari.